On awakening, it was found Ben was not feeling too well. He was still unable to stomach food. So we decided to stay the day. He could not leave here without fuel in his tank. Last night there was someone hammering on the door trying to get into the hotel. This seemed to go on forever. Noises like this at night no longer bother me. The Christian Orthodox Church across the road from a hotel in Ethiopia calling all night and almost shaking the building with the message and in Peru near Cerro de Pasco the Bolivian brass instrument music, again all night, whilst ill, makes any other night time disturbances seem like bed time stories. Our rooms were fitting of the price we payed. None of our toilets worked. Luckily, they had doors. They were soiled for the duration. My hand basin drained water onto the floor. It was a sleep in your sleeping bag affair. No bed bugs though, so full marks on that one. People were forever just walking into my room if the door was ajar. The morning was spent trying to get some reading glasses, my eyes were tested. I finally settled on some cheap generic 2.5 strength lenses. Up at the corner of where we were staying a woman was selling fresh fruit salad, this was enjoyed. She cut the fruit as it was ordered. It was decided to get Ben some Ciprol and get him on this for a short 5 day course. The guys also bought some Secnidizol to take later for worms and parasites in their stomachs. We ate well, at least Cal and I did. Across from the Spears supermarket in the main street was a great cafe selling very well presented food. Both Cal and I benefited from the food Ben could not eat. By the time, the evening came Ben was feeling a tad better and ate a few things from his plate, again at the same cafe. I spent the afternoon in an internet cafe, the internet was slow and patchy as usual. It is a tedious job uploading photos to my blog. Keeping this account of my travels has been a great way to add purpose to these journeys. In the spoken word, I enjoy mixing words for effect. I try to do so in the written word as well. However to be creative it takes a certain place and most definitely a state of mind. Importantly, if these accounts are ever to be elaborated upon at a later stage the backbone is in place. Some days when writing I am in the zone and the words flow beautifully, others days upon completion nothing more than a basic diary of accounts has been documented. I have a seed of an idea for some writings, loosely based around a cycle adventure. However, like said, the creative zone has to be found to germinate the seed into something that inspires myself to take it through to fruiting and all along the way be interesting to others. Importantly these words and the music on my blog will hopefully rekindle many memories later in my life and in doing so provide inspiration for something unique to be documented. Ben was feeling alot better, but still really had not eaten for 3 days. He did have a good breakfast. We were on the road at our designated time of about 0800. Things were wet but always dry out very quickly. Cal had checked out the trip profile. It was to be an easy ride. Gentle slopes both up and down to the edge of the Rift valley, then rapidly down and back up again and the all down into Nakuru. Ben would cope with this kind of leisurely ride even on a half full stomach. 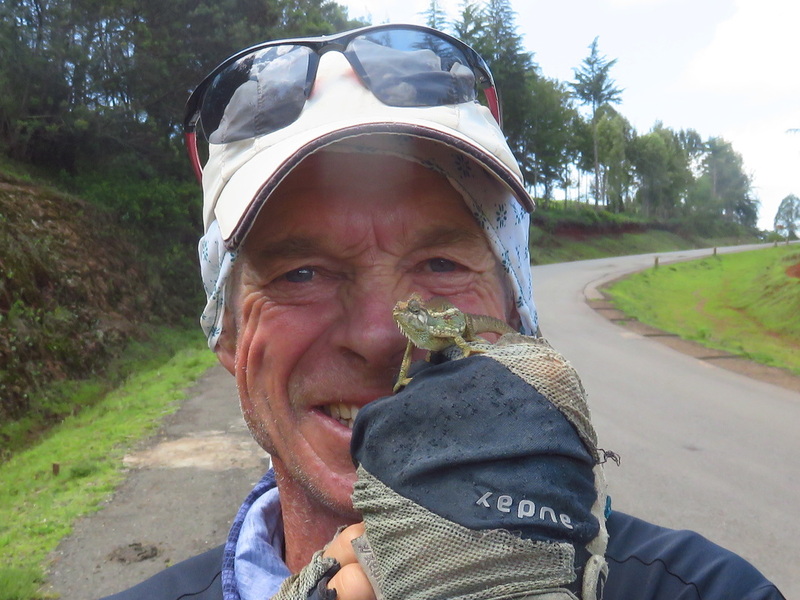 Some 15km out of Nyahururu we stopped for mendasi and chai. I told Ben I would not log this but it is amusing, on leaving the cafe, he could not find his trip computer that he mostly takes from his bike when we go in an eatery. Anyway, on leaving he could not find it we went back in and asked. There were some children watching us eat. They immediately got the blame. He was really annoyed, as he left. Anyway, to cut a long story short some half hour later he found it in his hat on his head of all places. It was very amusing. Later on just to rub salt into the wound I told Ben I had just found my reading glasses. “Where”, he said. “In my hat”!! I replied. It was great he had found it. The riding was indeed easy, there was little traffic. Many people were walking along the roadside, well dressed and going to their respective churches. Of which there are dozens. Many are in tin sheds, almost all are dodgy evangelical set ups with the most ridiculous names. Like the Winners Church or the Redemption church. A woman stopped Cal and I and started telling us how Christ is coming back. I said I will come and see you in 20 years and we will talk again. Everyone is entitled to his or her beliefs. 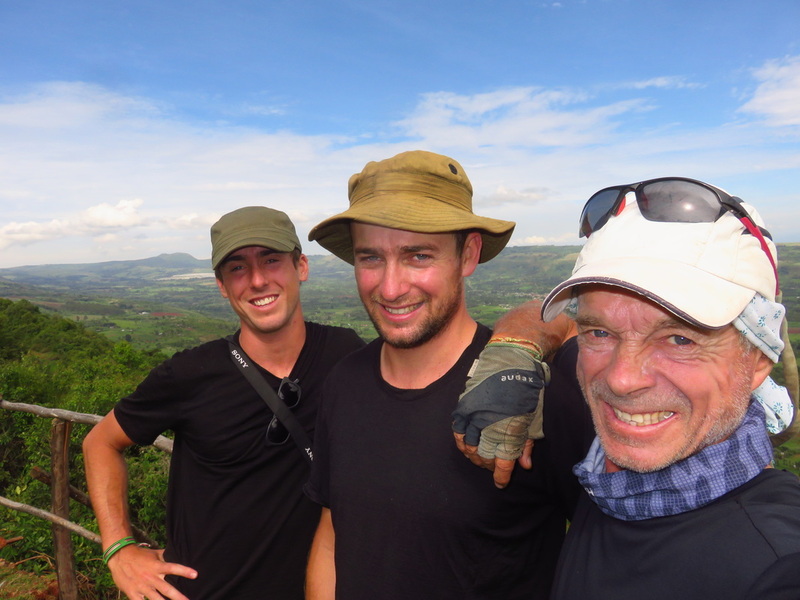 We soon got to the look out over the Rift Valley, it was spectacular, we stopped here for sometime, took pics and got hounded by guys selling stuff. Cal bought a little bracelet. It was a rapid descent down from 2500 to 2050m. Then almost straight back up again. The road was patchy in places and could not be trusted at speed. 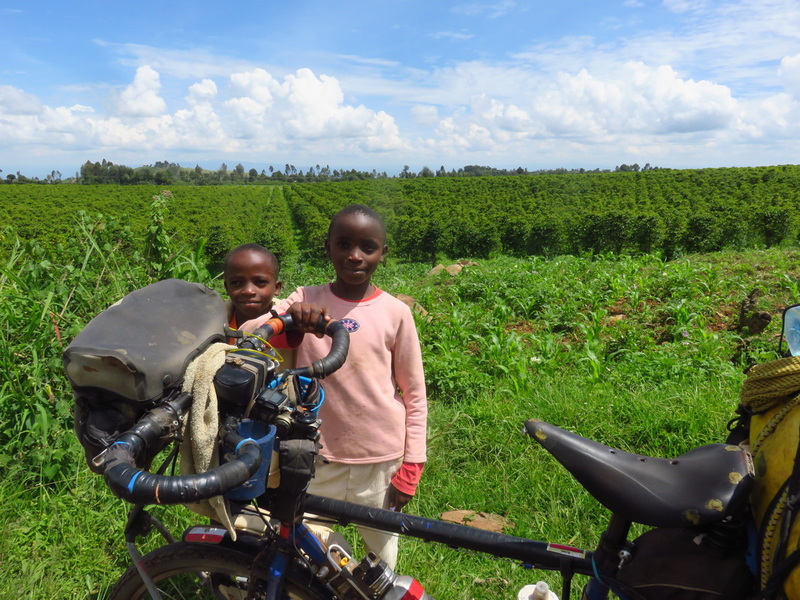 Up on the plateau on the other side of the village of Subukia, there were tea and coffee plantations. We had been crossing the equator 3 times during the trip as the road snaked across the line of zero latitude. A stop was made in a small village for fresh veges at the little market. Fillings were bought to have in rolls at our hotel. This is my second time in Nakuru, it could not be avoided as there are few roads that skirt the large city. Those that do are dirt and would become impassable in the rain we are still getting most evenings and early mornings. We looked for other hotels out of town but returned to the Indica down from Nakumatt where I stayed last time. The owner gave me a discount as I was a regular, booking 3 rooms he was happy. We had a relaxing afternoon eating fresh rolls outside and chatting. It was so nice to be in a comfy cleaner place for the night. Dinner was had in the bar next door. Ben is better but still not eating properly. The local paper was scanned. It seems every second article is about corruption and graft at all government levels. Kenya really has a problem in this respect. Especially, with the tendering process on civil and local government projects. 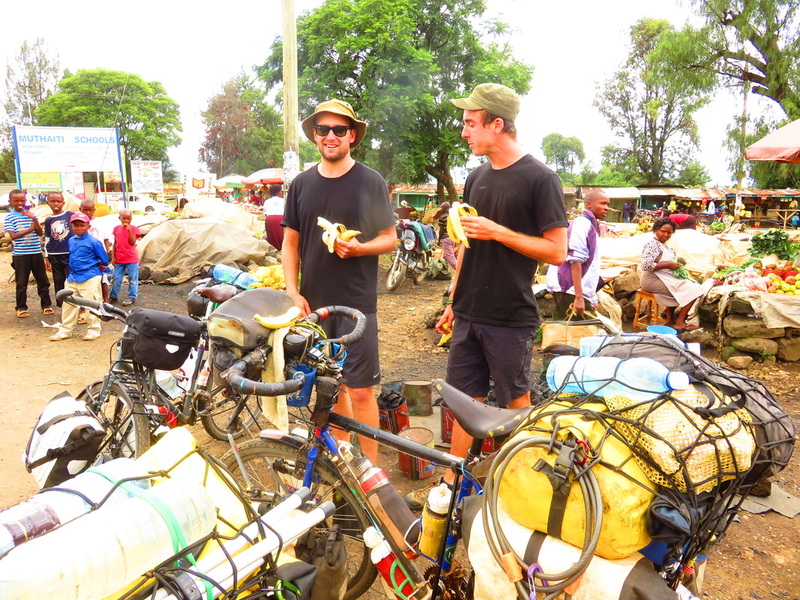 Cal and I caught a bike down to Nakumatt to get some food. It was no problems to have two of us on the back of the 150cc bike. The hotel in Nakuru, the Indica, was a great spot and caught the sun. It was also very clean except for a few cockroaches. Once out on the road it was a slow climb from town overlooking the lake. From here we somehow took a wrong turn and ended up on the B4 and were heading north to the turnoff to Eldama Ravine. As it turned out it was a great mistake, if you can have one of those. 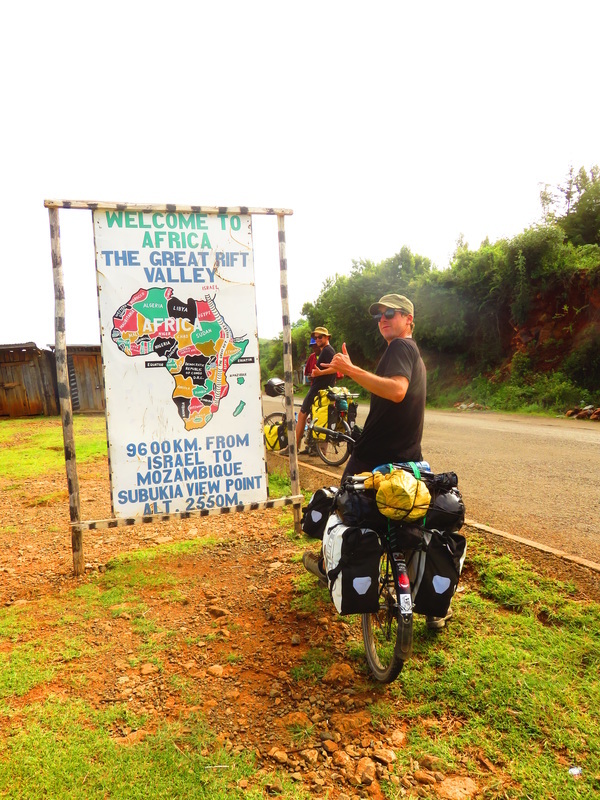 The ride into the bottom of the Rift Valley was just the most enjoyable 30km. It was gently downhill and free of much traffic coupled with just the most crystal clear day. 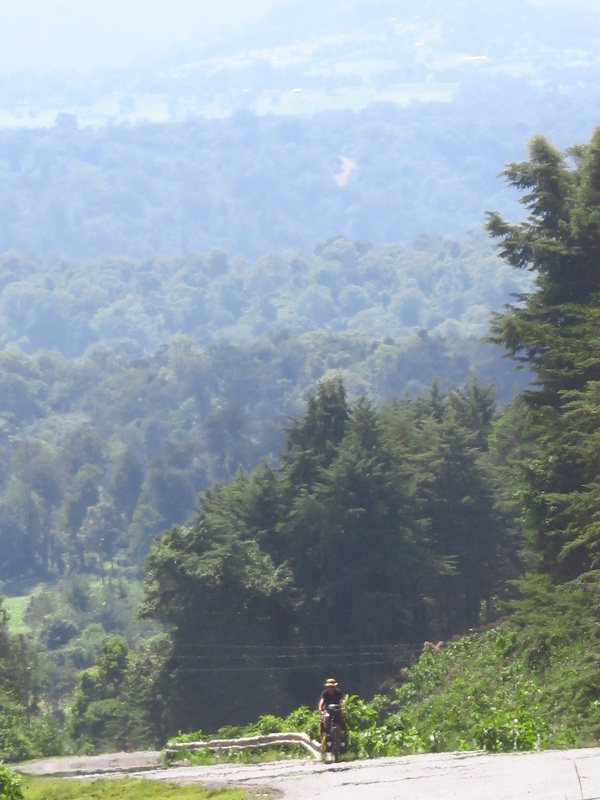 I had ridden this road on the way to Nakuru. We stopped in a village and enjoyed mendasi and chai, we do the most days now, it gives us that little boost, and is relaxing. At the turnoff to Eldama we bought a hip flask of honey each. This honey is so natural with a strong flavour. From here, we slowly started climbing from the bottom of the Valley. I came across the tree that a photo was captured of a few weeks ago. There were some herders nearby. I wanted to know the name of this giant succulent that is common in these parts. The Kalenjin name is Kuresiet. We stopped soon after and enjoyed sandwiches and blanched broccoli and green beans. Two women joined us, they were nice, but ultimately wanted money to buy sodas. This annoys me so much. It is just nice to chat with people who want nothing. We all had a couple of plates of chips and did some washing. I went on into town to get some more cards printed at the same place as before. Rarely, are the same towns visited during my riding but on this occasion it was nice to be back in Eldama Ravine, it is a nice size town with all facilities. Yesterday time was spent on the side of the road for half an hour with an Italian guy and his girlfriend who were travelling. He was a bit older than me. We had a great chat . He asked me why I was doing this. I said firstly because I love the lifestyle. Secondly, I told him because I have the time. Money is not so important when it comes to travel by bicycle but time is very very important. It is something most people my age don’t have. Many have money but are time poor. Many people sit there and wish they could do certain things. Really, they are captives of their own success. Debt, big homes, holiday houses, boats, rental properties and all that kind of stuff. They are just nooses in disguise around ones neck. When people say to me, I haven’t got the time to do this. What they really are saying is I don’t want to let go of my material possessions and cure my addiction to these material possessions. I will also go onto say that having a partner who does not want to embark on this kind of adventure can be the greatest hurdle of all to fulfilling ones dreams and aspirations later in life. Life really is short. I have yet to see a 60 year old couple out there on the road, travelling for any length of time!! Of course most important of all is, you must enjoy what you are doing, the other pleasures just follow. We took our time leaving and had chai and mendasis in the restaurant. Tomatoes and bread were bought. As soon as we left town we were in the wilderness, there was little traffic, just a few tractors moving logs. There were forests of pine and cedar in many places. A few km into the journey the climbing began. This was the need to get out of the Rift Valley. One particular climb was seemingly never ending. Ben is now getting road fit and rode the whole way up. He is doing so well and losing weight. We had lunch in the small village of Tolongo, on arrival here, we were mobbed by dozens of school children in red jumpers, the chased us up the road to the town. Here we enjoyed lentils with cut up chapati. This was had with 3 chais. All this for eighty bob. This is the price local villagers can afford to pay for a basic meal. It was tasty and very fresh, many locals were in eating and watching the news on TV. It began to rain as we left. There was no point in putting on our coats, as all the climbing to come would have seen us just as wet on the inside. Some 5km up the road there was a sign to a village on the left, it was red dirt. Asking people we found it was a god short cut back to the main road. If it rained any harder we would get trapped on this red soil. We had to walk down the first descent as the road was too slippery. 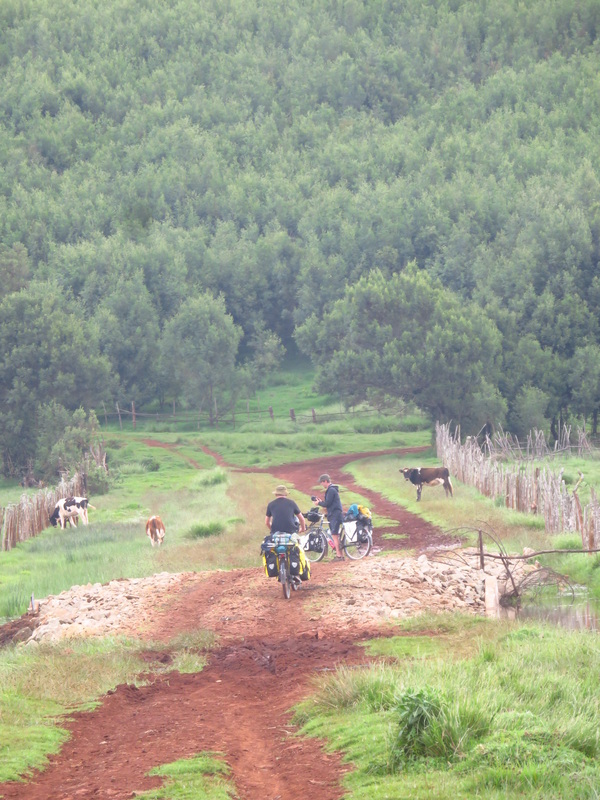 Riding through here was a pleasure, it was just dirt tracks and small farms all with maize in the paddocks. There were some big climbs and very rough descents, again Ben handled it greatly. We were in here for most of the day. Once back on the main road, it was 8km back to Nabkoi and onto to route C36 west to Kapsabet. We were all worn out. At a sawmill we stopped to see if we could camp there. Within 5 minutes 50 people were about, this was not a good idea. Riding on we finally got to the Nabkoi turnoff and bought things to eat at the stalls on the corner. It was now 1800, we were going to have to camp. Up the road further, we inspected a few potential sites but were always spotted. Further on, we came to a pine forest. Within 10 minutes a good site was spotted, all we had to do was get off the road without being seen. Once at the camp we set the tents up in the dark and had bread and salad sandwiches. We were all in bed by 2030. I was asleep in minutes. It had been a big day. 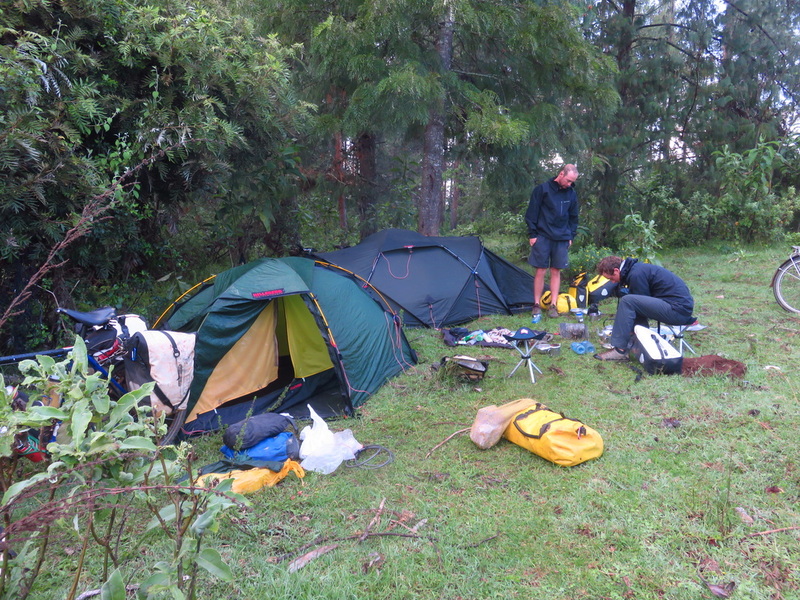 We were lucky to have been able to set up camp in the dry. We had an undisturbed night and all slept well. The condensation in our tents was extreme. It was great to be eating breakfast in the bush for a change. I decided not to take the inner out of my tent before packing it. My rear tyre was flat so this had to be repaired before moving out onto the road. Once out there. Just over the bridge were some people on the roadside selling Chapati. We each bought one of these and a bottle of water each as we had depleted our supplies camping last night. The road was now just a gentle downhill run. We got to a village and decided to dry the tents on a spare piece of land beside a shop. Well within 10 minutes we had an audience of 40 people, they were all very friendly and asked lots of questions. My rear tyre had sustained another hole again. Stopping here suited because there was a puddle of water to help find the hole. It turned out to be very small, without the water it would have been difficult to find. Leaving the inner in my Hilleberg Soulo tent turned out to be not a good idea. Much of the condensation found its way onto the floor of the inner, this was very slow to dry. We were here chatting for three quarters of an hour. As soon as the tents were dry we moved on. From here, a steady descent began. There were judder bars in many places on the way down .On one of these my rear wheel lifted off the ground and came down rather heavily. On arrival in Kapsabet we asked as to the whereabouts of the Nandi Rock hotel. Some people at the tent drying gathering had told us of this hotel. Kapsabet had a few tarred roads but the rest were black dirt. It had recently rained and the place was literally just mud. 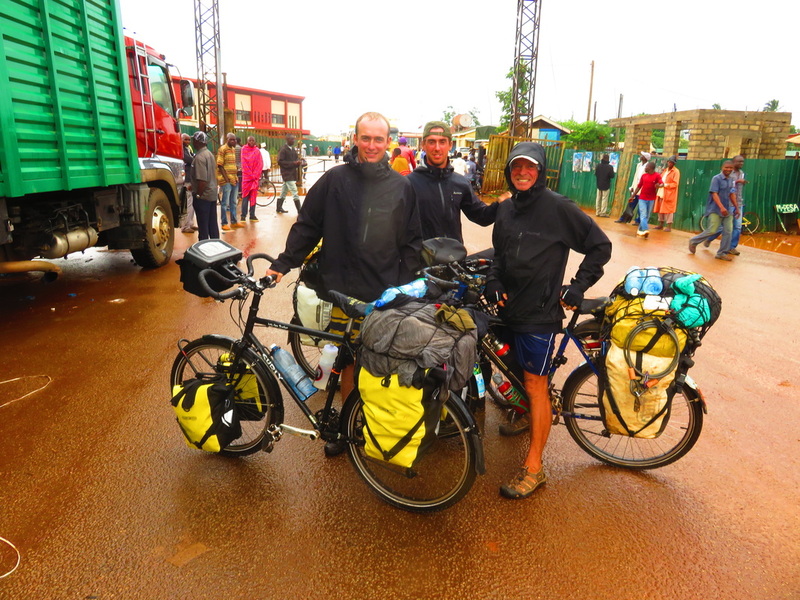 We pushed our bikes up through a clothes market area in the mud. Here young children and adults alike were seen sniffing glue in bottles. A group of young boys followed us. They were filthy and had hip flasks of glue to their noses. We told them to leave us alone and go home, sadly home is the streets. Once up at the hotel we booked a room each it was a basic set up with bucket showers and a squat toilet arrangement. On the way here, my rear wheel felt odd. Sure enough, the landing off the speed hump had put it out of round and it was not true. I spend 2 hours trying to get it right with no success. I rang Nixon in Iten and told him. He said bring it up tomorrow. This is becoming a real problem. Shipping a replacement from the UK takes time and rapid dispatch is very expensive. So early the next morning I was on a matatu, first to Eldoret then on up to Iten. Here Nixon took two hours to get this truing done correctly once and for all. The rim is slightly damaged and is impossible to get perfectly round. We even tried hammering the bad spot with a mallet and a block of wood. Anyway Nixon did as best he could and got it to within a few mill or more. Importantly he did the spokes up super tight. It is a 32 hole wheel. In hindsight a 36 hole rim would have been better. I had lunch in Eldoret and was back in Kapsabet by 1500. Here at the hotel, there were roosters in the courtyard by the kitchen area. Each morning they would begin crowing at 0400. These birds were slowly killed off in the two days we stayed here. Ben and Cal ordered chicken on their last night. It was rooster, the leg meat was red and needed a sharp knife to remove it from the bone. Before leaving the rooms we went into town to buy vegetables and bread in the hope we would be able to camp in the Kakamega national Reserve. Again, the ride was generally downhill. We left the tarmac after some 19km and took the dirt road into the forest. Water was put in our bladders at a health clinic in a small village. All three of us had upset stomachs and diarrhoea. We took it easy and were lucky it was mostly downhill. Woman were carrying out loads of firewood on their heads. 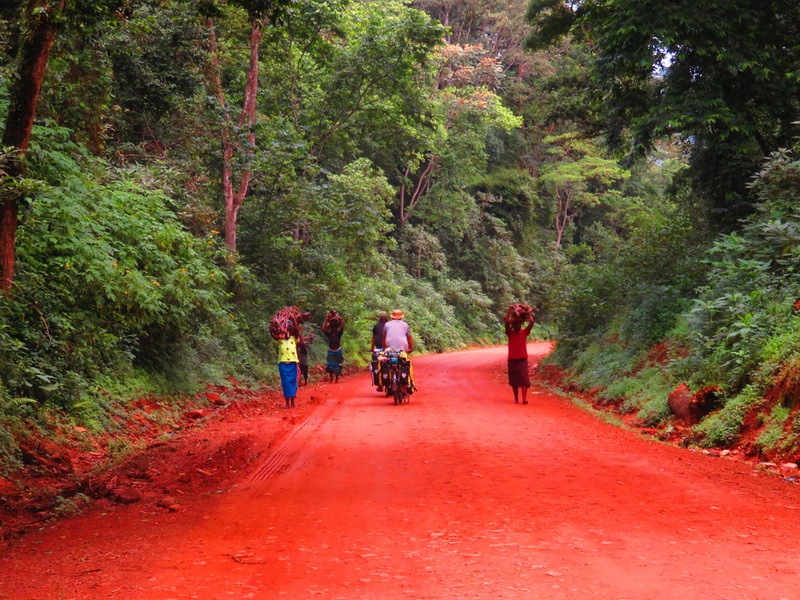 The road was a very bright red soil. The peacefulness did not last long, soon we were in private land again. The roadside was busy with people walking. Though places were seen where we could camp, they were mostly very wet and shady. We decided to head on the Kakamega. We soon got to the main road and turned right. Again it was an easy ride down to the town some 8km away. Once in the town we bought a fresh pineapple and went looking for a hotel. The Comfort Inn was booked, which is located just before the Friendly Hotel. Again, we have a bit of bargaining power with the need to book three rooms. Once settled in here the rains began. It was perfect timing. We had fried potatoes in the room. Ben and I both had the runs bad coupled with upset stomach, Cal is similarly affected though to a lesser extent. I was not feeling at all well, this diarrhoea was taking its toll. I thought it best to stay another night here. Not that I wanted to as last night bed bugs had given me a good chewing last night. They were seen crawling up the mosquito net as light approached. I told the woman who managed the place. When asking for another room and we wanted to spend another night here she said they were full. So, we decided to move on. A stop was made at a local supermarket to buy a few things. I managed to buy a new pair of cheap reading glasses as the others are not suitable. They are so small the frames can be seen as I read. The countryside is still very lush and thankfully flat, my energy was very little. The Malanil tablets for malaria prevention are also affecting me I feel. The fields are now full of sugarcane. 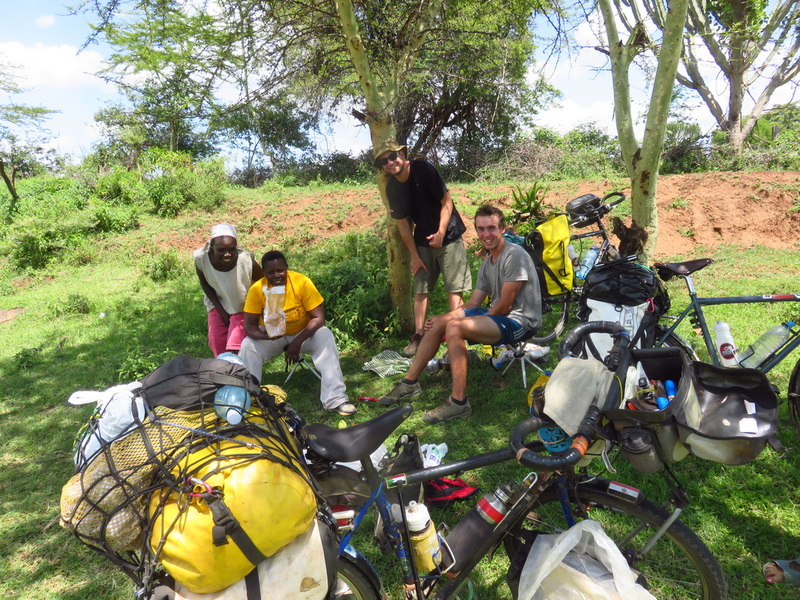 Soon we got to Mumias and stopped for a cold drink in a small cafe. We met a couple of local guys who were very informative about lots of local topics. Mumias is a poorer town than Kakamega, many people work in the huge sugar mills and in the fields. They are lowly paid. There were few hotels in the town. We had to settle on the West Gate hotel out of town. It was expensive by our standards but comfortable with a pool, that we did not use. It was powered by a generator. The owner told us they were very quiet. I felt it was a case of over capitalisation for the location. I think he knew that too. Anyway we cooked pasta in our room and did los of washing under the hot suicide showers. Each room had a balcony so things could dry overnight. I have started taking Ciprol for my diarrhoea. It was hoped not to have to use antibiotics but it just keeps persisting. It had been great to stay in a hotel with a few mod cons. The owner joined us for a cup of tea in the morning. I told him about the generator fumes in the guest area. He said they tried to move it but things did not work properly. Anyway we got on the road about 0830. Riding was easy through generally flat country, many people were on bicycles which is always a good sign of flat country. A few rivers we crossed were running brown and swollen from the still present rains,. 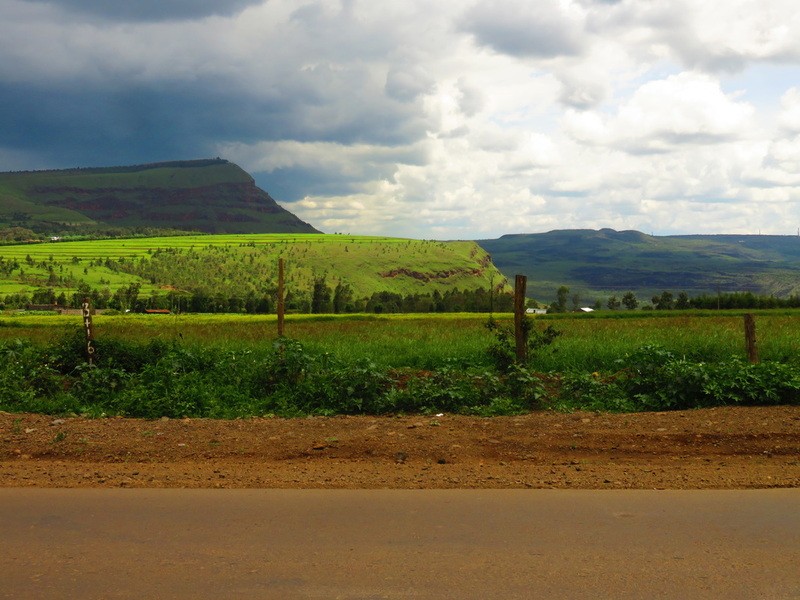 In no time at all we were on the outskirts of Busia. The first thing we did was go to a supermarket and get a few supplies that we were familiar with and also to spend our small change. In each country, it takes a little while to find the best milk powder. 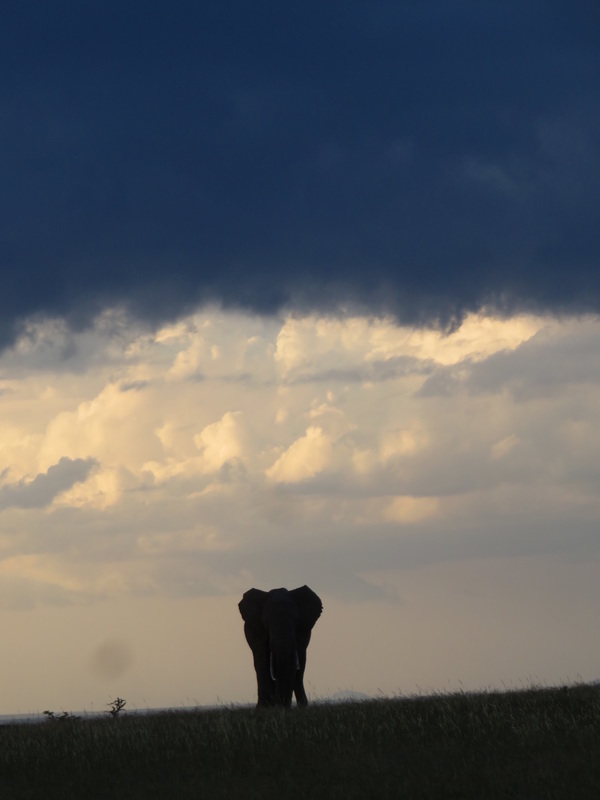 Here in Kenya it was Miksi. Nestle Nido is available everywhere but is very costly. From here we headed to the money changers to get out KS changed into UG shillings. We got a great rate, 31UG for 1 KS, with the money we had, a bundle of UGS1,058,000 was received. Just as we were changing the money, it began to torrentially rain. We were soaked in no time. Like all border towns there were trucks everywhere and people selling what they could. We headed across and got stamped out of Kenya and on to the immigration in Uganda. Here I had troubles with my 20 dollar US bills, they would not take them because they had small tears. It took two attempts to find some they would accept. It was still pouring heavily by the time we were ready to cross the border. Once on the Ugandan side the town of Busia just continued. Food and hotels were cheaper. 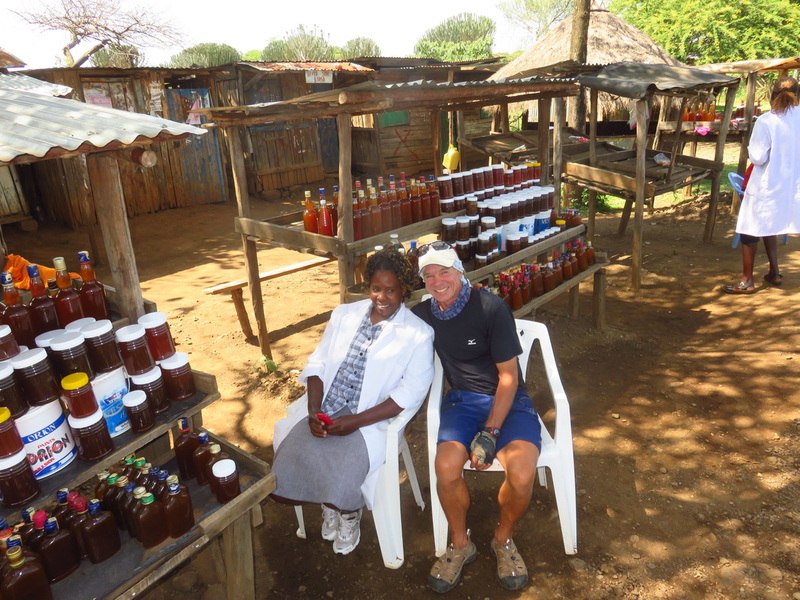 It was great to have a change in food from all the ugali we have been eating. A room was booked and we dried ourselves out. Later, a trip was made to get sim cards for our phones. We chose Airtel as people said it offered the best data options. Uganda had a nice ambiance about it, the people paid little attention to use and all were really friendly and helpful. Many spoke good English.